Space shuttle Atlantis, seen here on the move in May 2011, will depart on Nov. 2, 2012 on its final transport to NASA's Kennedy Space Center Visitor Complex. A month from today, NASA will make its final delivery of a space shuttle to become a museum display, and the public is invited to celebrate the journey. On Nov. 2, space shuttle Atlantis will be transported from NASA's Kennedy Space Center in Cape Canaveral, Fla. to the nearby visitor center. The 10-mile (16 kilometer) road trip will take about 11 hours, including a three-hour stop to give the public a chance to walk around the spacecraft. 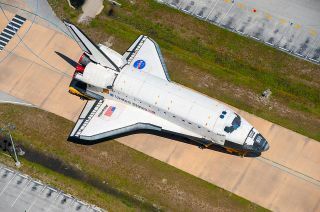 When it opens in July 2013, the Atlantis exhibit at NASA's Kennedy Space Center Visitor Complex will showcase the shuttle and its 30-year history. Guests will see Atlantis as it looked during its 33 spaceflights, its payload bay doors open and (replica) robotic arm extended. Surrounding the shuttle will be more than 60 exhibits spanning two floors, including a full-size replica of the Hubble Space Telescope. Since August, Atlantis has been in Kennedy's last active Orbiter Processing Facility (OPF), one of the three large hangars previously used to service and prepare the shuttle and its sister ships for their next launches. Now it is where Atlantis is undergoing the final steps in its transformation from a space-worthy vehicle to a museum display. Early last month, a mockup of the space shuttle's external airlock was mounted inside Atlantis' payload bay. Then on Sept. 20, the 60-foot-long (18 meter) doors to the cargo hold were closed in preparation for the upcoming transfer. On Oct. 17, Atlantis is scheduled to depart the processing hangar for the last time and be rolled the short distance to the Vehicle Assembly Building (VAB), where, while it was still flying, the shuttle was mounted to its rocket boosters and external fuel tank before leaving for the launch pad. Here, it will sit temporarily parked and visited daily by busloads of tourists, as it waits for its Nov. 2 trip to the visitor complex. Atlantis will make that move on top of NASA's 76-wheeled Orbiter Transport System (OTS), a flatbed vehicle that for decades moved shuttles between the processing facilities. Were the orbiter the size of a car or even a small truck, its trip to the visitor center would be rather straightforward. But as Atlantis has a 78-foot (24 meter) wingspan and a 58-foot-tall (18 meter) tail, its route needed to avoid roadway overpasses and large structures, such as guard shacks. As such, instead of just heading down State Road (SR) 3 and hanging a right at the ramp to SR 405, also known as the NASA Causeway, Atlantis will take the more "scenic route" to the visitor complex. Exiting the VAB at about 7 a.m. EDT (1100 GMT), the shuttle, atop the OTS, will still proceed south on SR 3 but rather than turning toward the complex at the Causeway, it will head east to pass Kennedy's Headquarters building before looping back to the site of NASA's new Exploration Park along Space Commerce Way. There, Atlantis will be parked for three hours, as visitor center guests are bused in to view and photograph the shuttle. By 3 p.m. EDT (1900 GMT), Atlantis will be on the road again, continuing down Space Commerce Way to SR 405 and then heading north to the visitor complex. Rolling up to the center at around 6 p.m. (2200 GMT), Atlantis will move into its new six-story exhibit building through the still-partially-open back wall that will be completed soon after the orbiter is inside. The Kennedy Space Center Visitor Complex is offering the public the chance to be there for Atlantis' delivery. The "Celebrate the Journey" packages range from $50 per adult and $40 for children to see Atlantis as it rolls up to the complex, to premium tickets upwards of $90 per adult and $80 per child to also view and photograph the shuttle in 360 degrees at Exploration Park. Other ticket packages offer a bus tour of Atlantis' previous launch pad and mobile launch platform. By coincidence, the Astronaut Scholarship Foundation will be holding its Astronaut Autograph and Memorabilia Show at the visitor complex on Nov. 2. The event includes the participation of more than 30 former astronauts who span NASA's history from the original Mercury program through the International Space Station (ISS). Several of Atlantis' former crew members will be there, including John Blaha, Eileen Collins and Norm Thagard. Click through to collectSPACE to see a map of the expected route space shuttle Atlantis will travel on Nov. 2 from the Vehicle Assembly Building to the visitor complex. To learn more or to buy ticket packages for the Celebrate the Journey Atlantis viewing opportunity, see the Kennedy Space Center Visitor Complex website. For more about, or to buy tickets for, the autograph show, visit the Astronaut Scholarship Foundation's website. This story has been updated to correct the name of the California Science Center in Los Angeles, future home of the space shuttle Endeavour.